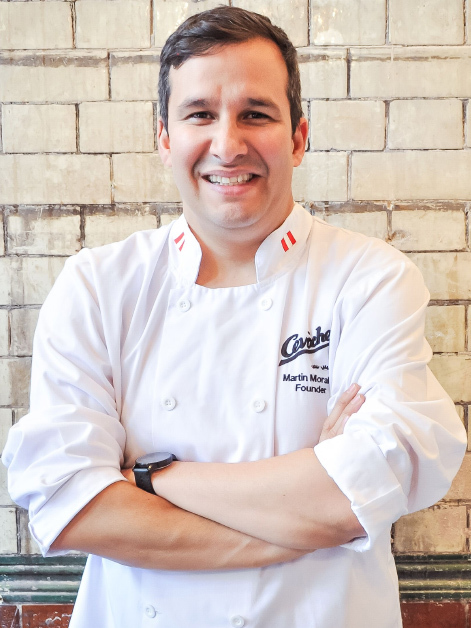 Martin is the award-wining chef and founder of Ceviche Family. Ceviche Family includes Ceviche and Andina’s five London-based pioneering Peruvian restaurants. Martin and his team kick started the Peruvian food revolution in Britain with the opening of the legendary Ceviche in Soho. Martin is the Editor for Peru in Truth, Love & Clean Cutlery: a guide to the truly good restaurants and food experiences of the World. His London restaurant Ceviche is also featured in the UK edition of the book, edited by Times food critic Giles Coren. Martin is the author of the bestselling cookbook Ceviche: Peruvian Kitchen -Sunday Times Cookbook of the Year - and a triple World Gourmand Award Winner. His cookbook has been translated into 13 languages and is the most widely distributed cookbook of Peruvian food in the world. His second book Andina: The Heart of Peruvian Food was recently released. He hosts his own YouTube Channel ‘Martin’s Peruvian Kitchen’ which features recipes and guides on where to eat in Peru. He was born in Peru but left after his British father was threatened by the Shining Path guerrillas and has lived in London for over 20 years. He has been cooking since the age of 9, is a self taught chef and in 2012 after years of research and training, Martin sold his house and put everything into opening his first restaurant, Ceviche in Soho. He is a creative who has worked across various disciplines most notably as a chef, restaurateur, music producer, arts curator and DJ and his company Ceviche Family also includes Tiger’s Milk Records (a music company), Ceviche Old St Gallery (an art gallery) and he is a trustee of Amantani – a charity helping disadvantaged children in Peru gain a better education. Inequality. Racism. Sexism. Elitism. We need to make some changes fast to improve our industry to attract more people to work in great restaurants. Something cooked by my Auntie Otilia. May she RIP. Her dishes were perfection: fresh ingredients carefully selected and bought in the market by her that morning, then prepped with her own 80 year old arthritic hands, then seasoned to absolute perfection. What she served was nothing short of unconditional love. Meditate and listen to latin jazz. Not together I must add. I’ve been lucky enough to win awards and reach great heights as a chef, restaurateur, entrepreneur and music producer, but I’m most proud of the smile on my children’s faces. Because I know I had and have something very important to do with creating their happiness. To rid lust away from my thoughts completely. And to bring myself into the now many more times a day than I do at the moment. I’m getting better at that every day and so I’m savouring moments, tasting flavours, seeing brighter colours, creating more beautiful things and feeling love more today than I ever did. Great yogis. And the mother of Andean cooking Monica Huerta Alpaca whom inspires me always. Of course! The last time was a few weeks ago on a beach in northern Peru where I surfed the longest wave in the world and then ate far too many fresh urchins tiradito style.